Every gram counts against you when you trek into the alpine for skiing and climbing trips, so be sure to have the Patagonia Men's Nano Puff Bivy Insulated Pullover packed away. This ultralight puffy uses Primaloft Gold Eco insulation to give the touch of warmth needed for active endeavors in cold places, and it's so compressible the jacket stows inside the front pocket for compact convenience on your harness or in your pack. 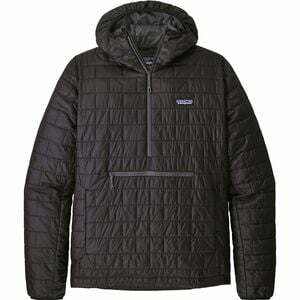 Patagonia treated the pullover's tough, recycled ripstop shell to shed snowflakes and raindrops. The Nano's hood fits under helmets with ease, and the adjustable hem stays secure under harnesses.